As the demand for bandwidth continues to soar, with higherthan-ever smartphone and streaming video usage, cable operators must face the challenge of deploying fiber deeper into the network. And because efficiency, speed, accuracy, and reliability metrics are key for increasing workforce productivity, the natural conclusion is simple: communications service providers (CSP) require a high-performance, efficient,yet affordable test equipment for installing future networks such as FTTx, RFoG and RF PON. 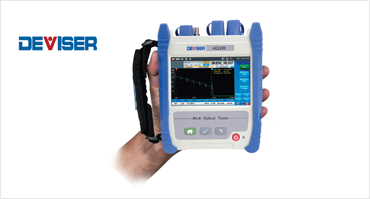 Brought to you by Deviser Instruments Inc, the AE2200 integrates cable TV analysis, metallic TDR testing and optical testing, including a fiberscope, OTDR, OPM, VFL and LS, future-proofing the investment in test equipment. The AE2200 enables faster, more efficient installations with only a single instrument, producing substantial savings to the CSP.